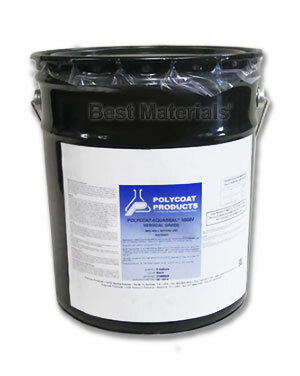 PRODUCT: Polycoat Aquaseal 5000 Waterproofing Membrane, Liquid Applied, Vertical / Roller Grade. 5-Gallon Pail. Price/Pail. Aquaseal 5000 is a single component, liquid applied, bitumen modified, coal tar free, urethane polyurea based waterproofing membrane. Easy to apply, the below grade system uses two coats and a protection board. An elastomeric system designed to expand and contract with normal structural movements. Used for both vertical and horizontal applications. Product is NOT suitable for UV exposure. Ensures years of dependable waterproofing protection. Used with insulation, pavers and/or ballast to create IRMA/PRMA roofing systems. OPTIONS: Also available in spray grade, Horizontal Grade, Water Catalyzing Grades.